Washington, D.C. (September 26, 2013) – With election results showing long-time labor champion Martin Walsh leading the field of Boston Mayoral candidates, Terry O’Sullivan, General President of LIUNA – the Laborers' International Union of North America – and Armand E. Sabitoni, the union’s General Secretary Treasurer and New England Regional Manager, offered praise for the Walsh campaign. “The voters have confirmed what we have always known: that Marty Walsh is Boston’s best hope for new jobs and training programs that will help boost the economy. 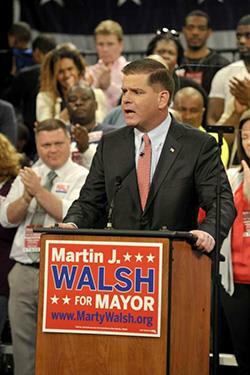 Having Marty as Mayor would be a tremendous victory for working families. Along with many others in the labor movement, we will do all we can to get our champion into office. He is the type of individual who has never forgotten where he came from and he has made all of us at LIUNA proud,” said O’Sullivan.